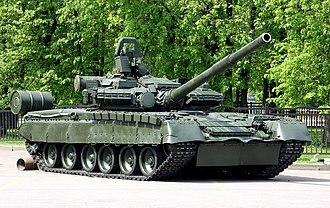 The 5th Guards Tank Army (Russian: 5-я гварде́йская та́нковая а́рмия) was a Soviet Guards armored formation which fought in many notable actions during World War II. The army was formed in February 1943. Until the aftermath of the Vilnius Offensive in July 1944, it was commanded by Pavel Rotmistrov. Its organisation varied throughout its history, but in general included two or more Guards Tank Corps and one or more Guards Mechanized Corps. It was considered an elite formation. 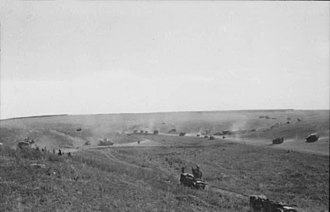 Under Red Army doctrine of deep operations, Tank Armies were primarily to be used for large-scale exploitation of major offensives. Once a breach in enemy lines had been made by other units (typically Shock Armies or combined-arms armies), the tank army would be inserted into the gap to drive deep into enemy territory, attacking rear areas and seizing major communications centers to disrupt the enemy reactions. Tank armies were expected to penetrate up to several hundred kilometers into the enemy rear. After the war, the 5th Guards Tank Army moved to the Belorussian Military District. It was downsized to division size in late 1946 and became a mechanized army in 1948. The designation "5th Guards Tank Army" was restored in 1957. The army was taken over by the Belarus Ground Forces in June 1992 and became an army corps two months later. The 5th Guards Army Corps was disbanded in 2001. Its headquarters became the headquarters of the Belarus Ground Forces. The 5th Guards Tank Army was formed on 25 February 1943 based on a Stavka order of 10 February 1943. It was part of the Reserve of the Supreme High Command (Stavka Reserve). The army included the 3rd Guards and the 29th Tank Corps, the 5th Guards Mechanized Corps, the 994th Night Bomber Aviation Regiment, artillery and other smaller units. In 1943, it played a significant role in the Battle of Kursk, being one of the formations tasked with the counterattack at the Battle of Prokhorovka. Subordinated to the Steppe Front, at Kursk the Army controlled the 18th Tank Corps, 29th Tank Corps, 2nd Tank Corps, 5th Guards Mechanised Corps plus smaller units with a total of approximately 850 tanks. Early in 1944, it took part in the reduction of the Korsun-Cherkassy Pocket. 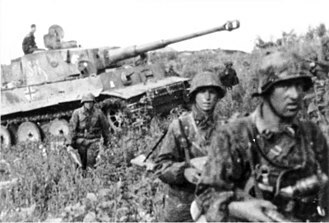 In June 1944, the 5th Guards Tank Army was used as the main exploitation force during the Soviet summer offensive, Operation Bagration. 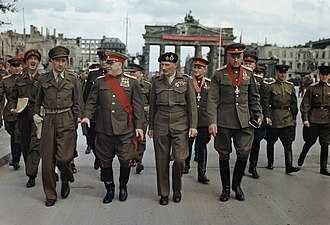 The formation was committed to an attack along and parallel to the main Moscow–Minsk road, following initial breakthroughs by the rifle divisions of 11th Guards Army, and was instrumental in completing the encirclement and destruction of German forces at Minsk. It was then employed in the third phase of Operation Bagration. 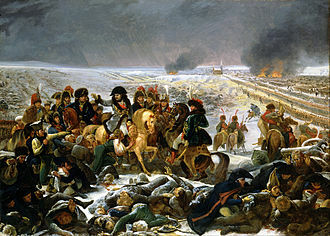 High casualties in this campaign, however, led to the unit's commander Lieutenant-General Pavel Rotmistrov being relieved of command and replaced with Vasily Volsky. 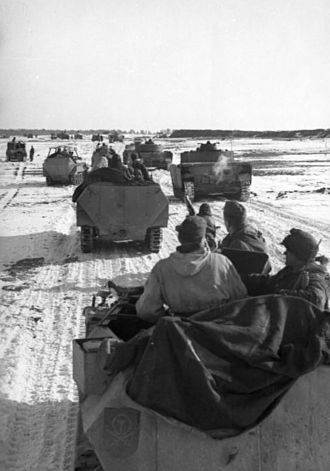 Late in 1944, the 5th Guards Tank Army was committed against 3rd Panzer Army as part of the Baltic Offensive, pushing the German forces into a pocket at Memel. 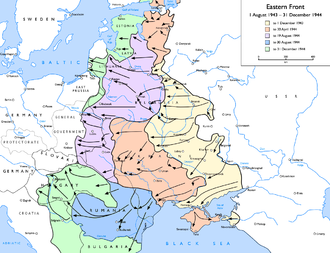 It was then moved south and took part in the East Prussian Operation as part of Konstantin Rokossovsky's 2nd Belorussian Front; driving to the coast at Elbing, it successfully cut off the Wehrmacht forces in East Prussia in what became known as the Heiligenbeil pocket. 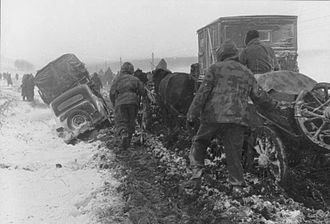 However, by March 1945, the 5th Guards Tank Army was being drawn down, with the subordinate 10th Tank Corps moved first to direct subordination of the 3rd Belorussian Front and then the STAVKA Reserve by 1 April 1945. This left the 5th Guards Tank Army with a single tank corps, the 29th, under its control. This reduction in strength coincided with the hospitalization of the 5th GTA's commanding general, Vasily Volsky, for tuberculosis. Volsky did not return to the army (he died in February 1946) and Major General Maxim Sinenko [Синенко Максим Денисович] took command from 16 March 1945 to the end of the war. After the war, Rotmistrov wrote a memoir and history of the unit, The Steel Guards. In July 1945, the army was relocated to Slutsk, part of the Baranovichi Military District. In February 1946, it moved to Bobruisk, after the Baranovichi and Minsk Military Districts had been combined into the Belorussian Military District. The army moved to Belarus with the 8th Guards and 29th Tank Divisions, and the 8th Mechanized Division, all formed from the corps of the same numbers after the end of the war. There, the 8th Mechanized Division was transferred and the newly created 15th Guards and 12th Mechanized Divisions joined the army. The army was briefly redesignated the 5th Guards Mechanized Army on 12 June 1946, and was reduced to the mobilization 5th Guards Mechanized Division (or 5th Separate Guards Tank Division (mobilization)) on 31 October 1946, with its divisions reduced to regiments. The unit was expanded into the 5th Guards Mechanized Army on 28 October 1948 as Cold War tensions increased. In the early 1950s, the 22nd Mechanized Division replaced the 15th Guards. By 1955 the army numbered 1,219 tanks and self-propelled guns, including 161 IS-4, 893 T-54, sixteen T-34/85, 75 PT-76, and 74 ISU-122, 24 ZSU-57 self-propelled anti-aircraft guns, and 705 guns. From then until the late 1980s the army's composition remained virtually unchanged – only the mechanized divisions were redesignated in 1957. On 20 May of that year, the army was redesignated as the 5th Guards Tank Army. The 22nd Mechanized became the 36th Tank Division, then the 193rd in 1965, while the 12th Mechanized Division became the 5th Heavy Tank Division and was disbanded in 1960. On 21 February 1974, the army was awarded the Order of the Red Banner. In August 1979, the 84th Motor Rifle Division (a mobilization unit) was attached to the army at Marina Gorka after transferring from the 28th Army; it was disbanded in 1987. Until the late 1980s, the army included three tank divisions – the 8th Guards at Marina Gorka, the 29th at Slutsk, and the 193rd at Bobruisk-25. Support units included the 302nd Anti-Aircraft Rocket Brigade at Marina Gorka, the 460th Rocket (formed 1988) and 306th Gun Artillery Brigades at Osipovichi, and the 56th Anti-Aircraft Rocket Brigade at Slutsk. In 1990, as the Cold War drew to a close, the 8th Guards and 29th Tank Divisions were reduced to storage bases. To replace the 8th Guards, the 30th Guards Motor Rifle Division, withdrawn from the Central Group of Forces in Czechoslovakia, joined the army. By November of that year, according to CFE Treaty data, the army fielded 238 T-72 tanks, 381 infantry fighting vehicles, and 228 guns, mortars, and MLRS. In June 1992 the army was taken over by Belarus after the dissolution of the Soviet Union, and on 12 August 1992 renamed 5th Guards Army Corps. The 5th Guards Army Corps was still active in September 2001, when the Belarus Minister of Defence, General Lieutenant Leonid Maltsev, congratulated the remaining Belarus Guards units on 60 years of existence. However, later in 2001, the headquarters of the Ground Forces of the Armed Forces of Belarus was established on its basis. There is a memorial to the soldiers of the 5th Guards Tank Army at Znamianka, Kirovograd Oblast, in Ukraine. The following officers commanded the army. ^ a b "5-я гвардейская танковая Краснознаменная армия" [5th Guards Tank Army]. tankfront.ru (in Russian). Retrieved 2016-02-25. ^ Combat composition of the Soviet Army, 1 August 1943. ^ "Biography of Colonel-General of Tank Troops Vasilii Timofeevich Volskii – (Василий Тимофеевич Вольский) (1897–1946), Soviet Union". www.generals.dk. Retrieved 2016-02-25. ^ a b c d Holm, Michael. "5th Guards Tank Army". www.ww2.dk. Retrieved 2016-02-25. ^ a b c d Feskov et al 2013, pp. 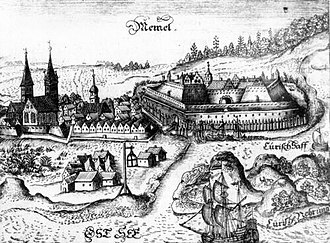 455–456. ^ 'Commander outlines reform of Belarusian Ground Forces,' Zvyazda, Minsk, in Belarusian, 2 October 2002, p.2, via Lexis-Nexis. ^ "Юбилей прославленного объединения" [The Anniversary of the Famous Association]. www.mil.by (in Russian). Archived from the original on 25 February 2016. Retrieved 2016-02-25. ^ "5-я гвардейская танковая армия. Памятник освободителям Знаменки" [5th Guards Tank Army Liberators Monument Znamianka]. www.shukach.com (in Ukrainian). Retrieved 2016-02-25. Glantz, David M. 'Companion to Colussus Reborn' Univ. Press of Kansas, 2005. Yegorov, P.Y. ; Krivoborsky, I.V. 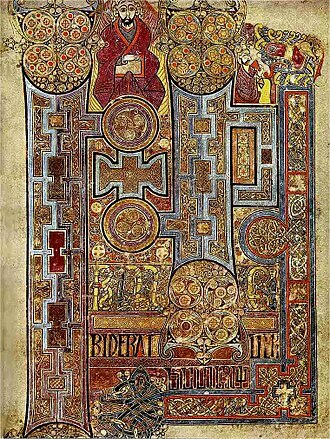 ; Ivlev, I.K. ; Rogalevich, A.I. (1969). Дорогами побед: Боевой путь 5-й гвардейской танковой армии [Road of Victory] (in Russian). Moscow: Voenizdat. The T-54 and T-55 tanks are a series of Soviet main battle tanks introduced just as the Second World War ended. The first T-54 prototype was completed at Nizhni Tagli by the end of 1945, the T-54 eventually became the main tank for armoured units of the Soviet Army, armies of the Warsaw Pact countries, and many others. T-54s and T-55s have been involved in many of the armed conflicts since the part of the 20th century. The T-54/55 series eventually became the tank in military history. Estimated production numbers for the range from 86,000 to 100,000. During the Cold War, Soviet tanks never directly faced their NATO adversaries in combat in Europe, the Soviet T-34 medium tank of the 1940s is considered to have the best balance of firepower and mobility for its cost of any tank of its time in the world. In 1943, the Morozov Design Bureau resurrected the pre-war T-34M development project, by the time the T-44 was ready for production, the T-34 had been modified to fit the same gun. 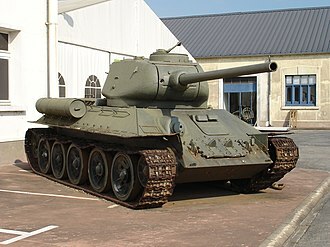 The T-44 was produced in small numbers, around 2,000 being completed during the war. Instead, the continued to use the design as the basis for further improved guns, experimenting with a 122 mm design. 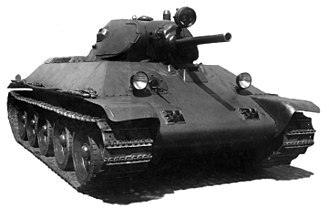 Efforts to fit the 100 mm gun to the T-44 demonstrated that changes to the design would greatly improve the combination. The main issue was a turret ring, which suggested slightly enlarging the hull. 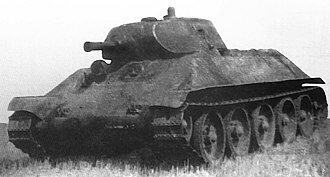 A prototype of the new design, about 40 centimetres longer and this model looked almost identical to the original T-44, albeit with a much larger gun. In testing, there were drawbacks that required correction and many alterations that had to be made to the vehicles design. It was decided to begin production of the new vehicle. It would go into production in Nizhni Tagil in 1947 and Kharkov in 1948, production of the initial series of T-54s began slowly as 1,490 modifications were made. The Red Army received a tank that was superior to World War II designs, the 100 mm gun fired BR-412 series full-calibre APHE ammunition, which had superior penetration capability when compared to the T-34 that it replaced. The 5th Guards Zimovnikovskaya order Kutuzov II degree Motor Rifle Division, named on the 60th anniversary of the USSR, was a military formation of the Soviet Ground Forces. It traces back to the 6th Mechanized Corps created in 1940 that was destroyed in 1941 in the beginning of Operation Barbarossa, the corps was reformed in November 1942 under the same name, but with a different organizational structure. In early 1943, the 6th Mechanized Corps was granted Guards status and it became the 5th Guards Mechanized Division in 1945, and subsequently the 5th Guards Motor Rifle Division in 1965. 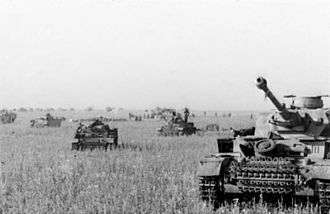 The 6th Mechanised Corps began to form on 15 July 1940 at Bialystok in the Western Special Military District and it was attached to the 10th Army in the Bialystok area and was under the command of Major General M. G. Khatskilevich when the German Operation Barbarossa began in June 1941, the Corps initially comprised the 4th, 7th Tank Divisions and the 29th Mechanized Division, as well as smaller units. A report by Major General B. S.
Vasilevich, commander of 7th Tank Division, on 4 August 1941 said that the division had been at 98% enlisted strength, the division included 348 tanks, of which 51 were KVs and 150 T-34s. However, there was lack of supplies and it possessed only one to one and a half loads of 76mm ammunition when it entered battle, no armor-piercing ammunition for its tanks, three refills of gasoline, and a single fill of diesel fuel. 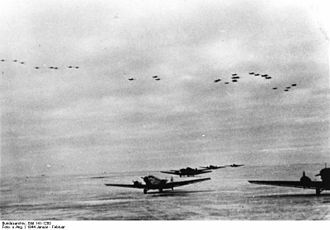 The fuel ran out quickly, partially due to unclear orders, the division had to move to three new assembly areas within the first two days of the war. The division was soon immobilized south of Grodno, similar to the 4th Mechanized Corps, the 6th Mechanized Corps stood out of the remaining mechanized corps of the Red Army. 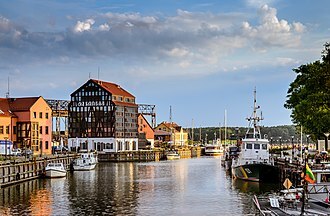 On 22 June 1941 it was formed, and stationed no further than 100-150 kilometers from the border. The 6th Mechanized Corps was heavily involved in the first battles with Germans, at 23,40 on the day of German invasion, Pavlov ordered his Deputy Front Commander Lieutenant General Ivan Boldin to take command over what would be called Boldins group. 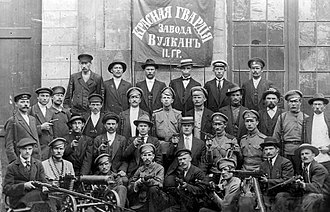 Guards or Guards units were elite military units of Imperial Russia prior to 1917-18. The designation of Guards was subsequently adopted as a distinction for various units and formations of the Soviet Union, the tradition goes back to the a chieftains druzhina of medieval Kievan Rus and the Marksman Troops, the Muscovite harquebusiers formed by Ivan the Terrible by 1550. The exact meaning of the term Guards varied over time, in the Russian Empire, Imperial Russian Guard units, derived from German Leibgarde, were intended to ensure the security of the sovereign, that of Peter the Great in the 1690s. These were based on the Prussian Royal Life Guards, during the 19th century the Imperial Russian Guard regiments were not exclusively composed of Russian troops, but included Lithuanian and Ukrainian units. 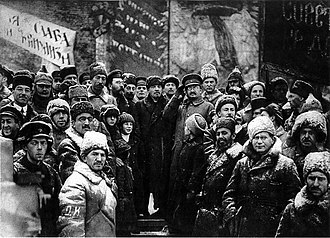 During the Brusilov Offensive the 1st and 2nd Guards numbers were supplemented with line army corp, in February–March 1917 the defection of reserve battalions of the Imperial Guard based in Petrograd was a major factor in the overthrow of the Tsarist government.